Kaseo of Japan recently posted his SK-8 with a GameBoy break-out box to the Benders list. Looks clean and I dig the photos with nice professional shadows and such. 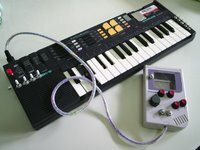 The trigger buttons on the Gameboy are linked back with a DIN connector to the drum sample buttons on the SK-8 allowing for great solos, if needed. 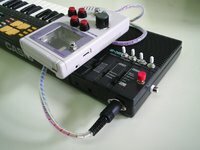 There are also glitch switches installed in the main unit and the sample mp3s suggest that those are effecting the drums. I can see the looks of chip-tune scene peoples’ when someone up on stage starts mashing buttons on a game boy while hearing sample sounds. 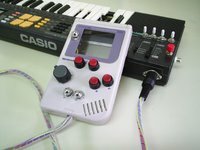 Original Gameboy does make for a nice breakout box and synth enclosure, but I am torn by destroying something that survived over 2 decades of use. However the fact that there were over 120 Million sold pretty much says that there are plenty to go around. So check the eBay. Here is the Video of the keyboard being played. Thanks. Kaseo.